Easy booking and drop-off/collection. Simple process and efficient handling. Located less than ten minutes from the terminal, Good To Go Park & Ride T4 offers a cost-effective, time-efficient and convenient solution for all travellers. Simply drive to the car park, grab your bags and jump on one of the regular shuttles to the terminals. 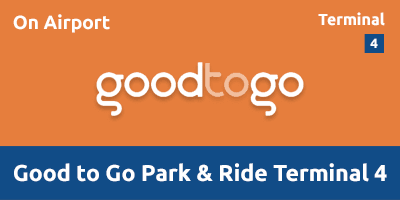 Good To Go Park & Ride T4 has staff on-site 24 hours a day, CCTV coverage, entry and exit barriers, security fencing and frequent patrols. The car park is a recipient of the police-approved Park Mark Safer Parking Award. Stays at this car park must include a Saturday night. This car park opens at 05:00 and operates 365 days a year. Go straight over and continue up to the traffic lights. Turn left at the next Junction. Long Stay T4 is on the right. Turn right onto Scylla Road and Heathrow Long Stay T4 will be on the right. Between 23:30 and 05:00 go to reception in the car park to catch a bus to the terminal.